Am I alone in the feeling that it seems to be getting harder and harder to create instructional links and connections for our students? The scripted math programs that require you to show a short video to the class about how to complete a math problem using a single solution and then assign problems that require 15 other methods to complete the homework drive me nuts! 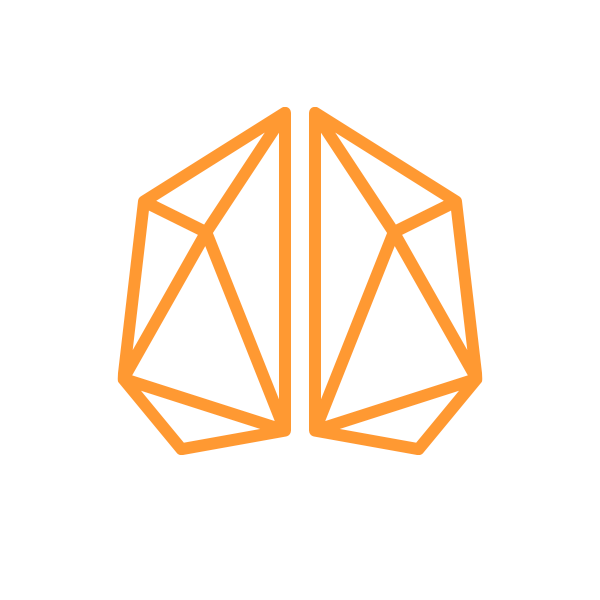 I found myself searching for a way to connect the games from ST Math to the lessons I teach day-to-day to give the kids a much stronger base of understanding. It was a bit of a struggle at first because I had to use the puzzles or games that connected to the exact concept I was teaching. 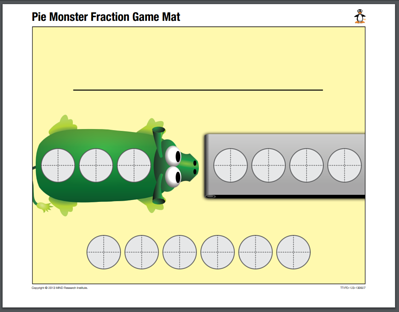 The key to using the games to help teach standard lessons or concepts is to reorder your regular content and the ST Math content to work together. I’ve done this for the past several years and it was truly one of the smartest teaching moves I made. Don’t always assume that the pacing guides we get are set up to be what’s best for the kids. Using common sense and cognitive building blocks to determine what should be learned first is the best way to go. Obviously you don’t want to teach equations before you complete decimals and fractions. Yet that’s exactly how most of our pacing guides are set up. Lay the content all out on paper and then do the same with the games in ST Math so they are in the exact same order. It makes a world of difference! Not only do the kids explore concepts right before you teach a lesson, but it allows you to know exactly where to find the concept in the bigger picture of ST Math. I have gone through and made notes about which games work best to link the concepts. Screen-shot some of the puzzles and then print them out for the kids to write on, or visit ST Math Central for printable game mats. I also highly suggest the use of white boards and expo markers. I actually went one step further and built tables with white board tops for the kids to actually write on the tables. 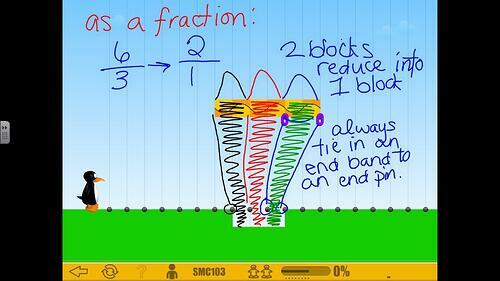 Check out these clever tools and manipulatives other teachers are pairing with ST Math. It has been crazy to watch the difference in them voluntarily working problems out versus the normal pulling teeth to get them to show any work. It has cut down on mistakes and allows them to better conference with their classmates about successes or struggles with a specific problem or concept. Obviously, each teacher runs their time blocks differently than the room next to them but I can assure you, you can use the puzzles to create a connection to the traditional classroom lessons. Today’s kids are tech savvy; they love being the master of the solution and the one to be able to explain to their peers or better yet, their teacher! Kids will not lose respect for you and you will not look unprofessional having the kids step up to the board. The opposite actually begins to take place. Many of my students have a stronger level of respect when I am able to convey that I productively struggle with some of the puzzles. Don’t get me wrong, it is important for us to play a bit here and there and get stronger at our knowledge of the puzzles. However, you won’t be a master at every game right away. I record students teaching me and then recorded them teaching me and keep a video file of it so I can use them as a reference. My favorite game, the one that gives me the biggest bang for my buck with all levels of learners in 6th grade, is Stretch-a-Block. I love that game! I use it for struggling students, to give them a stronger understanding of equivalent fractions and can also use the exact same mini lesson to help the upper level learners with ratios and proportions. What’s even better is when the kids use Sretch-a-Block to help each other. My heart fills with pride and excitement when my kids who have struggled end up being able to peer-teach using the game to help a fellow student. I’ve even had my struggling kiddos help their higher level classmates with ratios and proportions using this game. It was amazing to watch! The last few weeks of school, we worked on filling gaps and completing a project for a final math grade called “FIgure ME Out.” The basis for the project is that kids tell all about themselves using only math equations and questions. They must have 15 questions and it is done in a poster format. During the process of the kids working the room and solving each other’s poster problems, I challenged them to also search for mistakes and try to solidify areas of need they personally had. That led to one of my favorite moments of watching them use the games to help each other understand how to solve the problems. They weren’t just solving the problems for each other, they were full on teaching each other how to get to a solution. It was amazing. 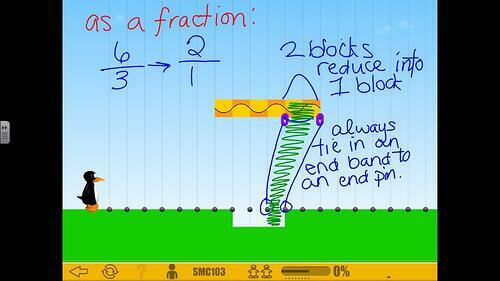 I took the following screenshots from one of the interactions on our Smart Board. It was a higher level student re-teaching/peer-teaching a student who has had real difficulties with math but after this interaction found one of the best “Ah-ha” moments to date. 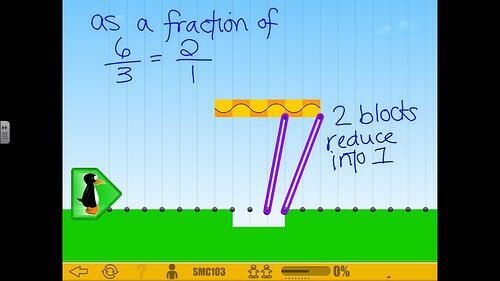 Starting out, we look at the Stretch-a-Block game as a fraction. The kids like to number the boxes to show how they find the numbers for a numerator and denominator. 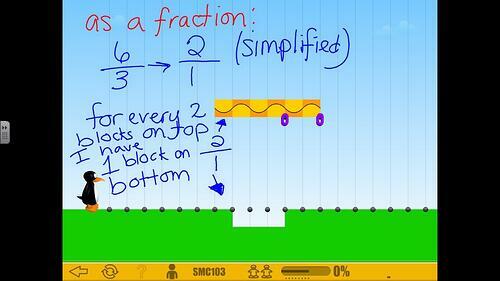 From there they rewrite the fraction and then reduce to solve the basic puzzle. I love that they make the notes just like I do when we look at puzzles as a whole group to solve them. Making the notations is a huge help. The lesson shows how to work out the basic proportion but also how to look at and approach the layout of the puzzle. They color code and show where everything should move. These steps align with what we expect from them in the traditional paper and pencil work. This step-by-step is great when you screenshot some of the puzzles and then print them out for the kids to write on! Stretch-a-Block is just one example. I have taken some of the most powerful games and captured screenshots of the various levels for us to work on them as a whole group. Of course it is important for students to work on the puzzles indepedently too, but working in small and large groups have helped me take ST Math to another level by bringing the thinking and conversation into the classroom. 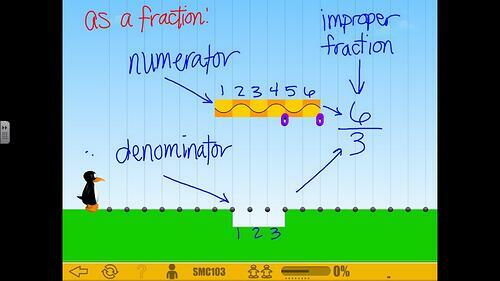 Interested in learning more about the ST Math program?